J.D. Power and Associates released their 2012 Canadian Wireless Total Ownership Experience Study yesterday, and within it reveals we’re buying more smartphones than ever. 54% of Canadian wireless users own smartphones, a rise from 36% a year ago. The survey is based on responses from 14,000 cellphone customers fielded from October 2011 to March 2012. As for the smartphones brands used by those in the survey? 33% owned a BlackBerry device (a 9% decrease a year ago), 30% had Apple devices (a 4% increase from a year ago), and 13% had a Samsung phone (up 4% from a year ago). Satisfaction is measured in seven factors: network quality; cost of service; account management; offerings and promotions; customer service; handset; and sales process. Carriers are ranked in two segments, full-service and stand-alone providers, which are differentiated by the range of products and services offered, as well as the ability of customers to bundle wireless services with other offerings. The survey found that customers were more pleased than ever with their smartphones, said Chung. He didn’t draw the conclusion that they’re more satisfied because they’re less likely to own a BlackBerry, however. Still, he pointed out that in previous surveys, telecommunications companies who were slow to offer iPhones to their customers suffered. “Carriers who didn’t offer iPhones were really punished in the satisfaction surveys,” said Chung. 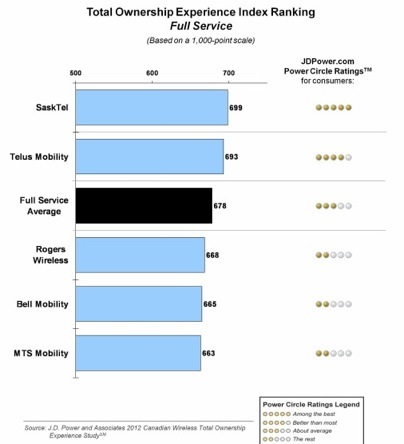 As for our Canadian carriers, SaskTel ranked the highest in customer satisfaction among full service carriers, followed by Telus. Rogers, Bell and MTS followed below the full service average. 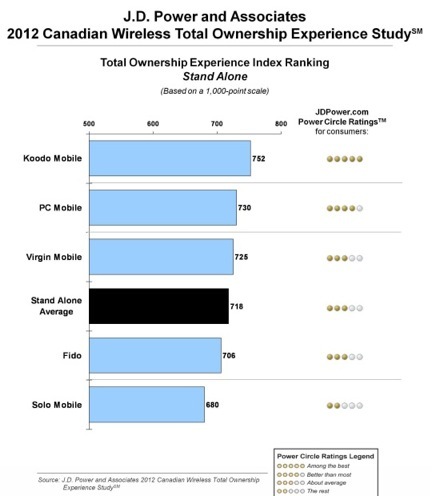 Koodo Mobile (a subsidiary of Telus) topped rankings for customer satisfaction in the stand-alone carrier category, followed by PC Mobile and Virgin Mobile. Fido and Solo Mobile were next below the stand-alone average. Anyone out there agree or disagree with the ranking of the carriers?